Just shake your device and get a random cow. The My Daily Cow® App lives entirely on your device and does not use your phone data plan or require WiFi while in use. And it moos – Go cows! 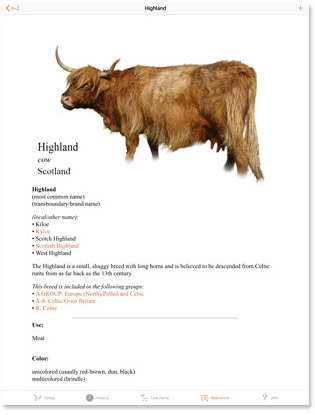 • All breeds now updated into GROUPS according to Felius and Mason. 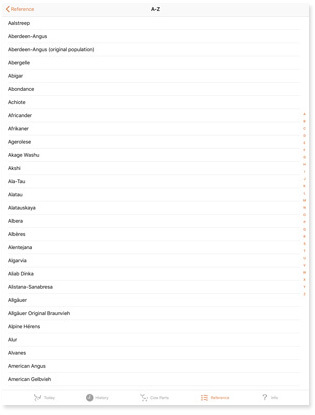 • More breeds added (from 709 to 761 breeds). • Hi-res images updated for most breeds. • Breed names clearly sorted by category according to DAD-IS, Felius and Mason. • Glossary expanded (from 160 to 630 terms). 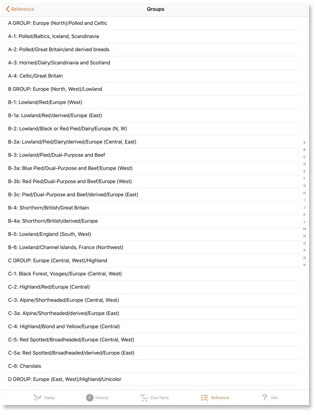 • Breed USES organized a bit better. 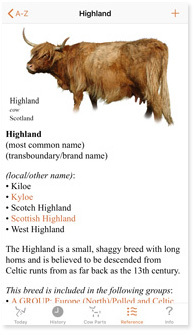 • Information has been expanded on many more breeds. When you download this app after purchasing — you’re done with the internet (except for updates). Your device only needs power for this app to work. 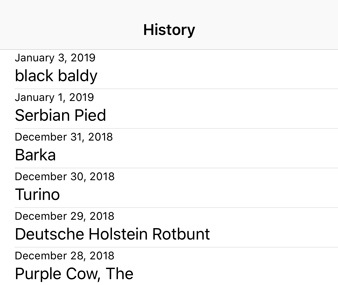 Today gives you a different cattle breed every 24 hours or whenever you start up the app again after 24 hours. 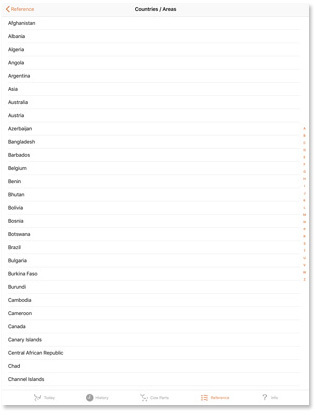 Your My Daily Cow® App scales to whichever iOS device you are using (see examples below). Useful Links Are Everywhere — Just Tap and LEARN! TAP any My Daily Cow® hi-res cattle breed image to isolate it – and when you turn your device to landscape view – that image will automatically become LARGER. Tap the BACK arrow and you will return to its information page. Can't wait another 24 hours for your random cow? SHAKE YOUR DEVICE! That’s right – we’ve invented Shake-A-Moo — every time you shake your device you get a different cattle breed (and some very a-moo-sing moo-sound variations. Shake your device as many times as you like. It doesn’t matter where you are in the app, either; you’ll get a cow. Just tap the Today tab on the bottom menu bar and you will go back to your cow of the day. Your current Today’s Cow breed is always at the top of your History list. 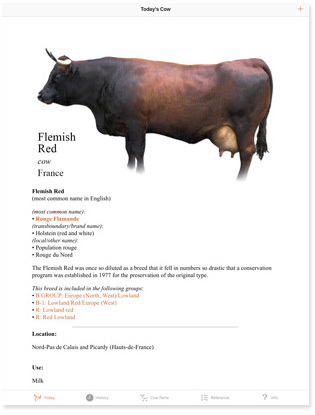 All cows are still available in the Reference section for you to browse or look up at any time. Add any cow you really like to your Favorites list in the Reference section by tapping the ‘+’ in the upper right-hand corner. Cow Parts is a section where you can roam about and discover over 100 cow parts — all of which are diagramed and/or explained. 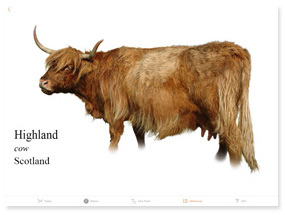 The A-Z section has 757 bovines so far — cows, bulls, heifers, calves, oxen, steers, bibovines, yaks and yakows — all in alphabetical order by breed name. 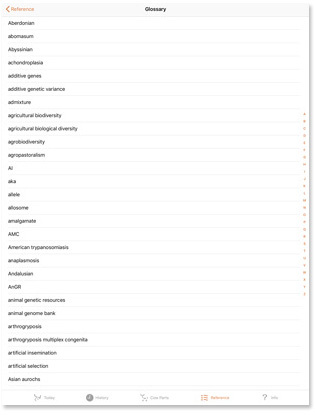 The Groups section shows you general cattle group divisions. Cattle breeds that share similar characteristics and originated in the same general area are listed under these headings. The Countries / Areas section organizes cattle breeds by place of origin with 151 different countries and areas represented. 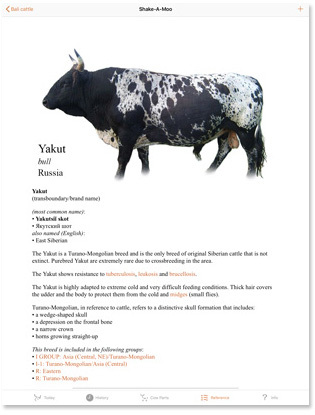 The Uses section lists 37 different cattle uses (milk, beef, work, fighting — and more) and then shows you the cattle breeds raised for them. Why list the term ‘milk’ instead of ‘dairy’? Cows do not produce ‘dairy’ — they produce milk; a cow can be used for milk. Our research has also shown that ‘milk’ is a more universally understood term for a cow’s use. This is why the My Daily Cow® App lists ‘milk’ as a major use instead of ‘dairy’. The Glossary section contains over 630 bovine-related terms*, nomenclature* and anatomy — all clearly explained. Want to know how cows really digest food other than some cartoon version you got in a coloring book? 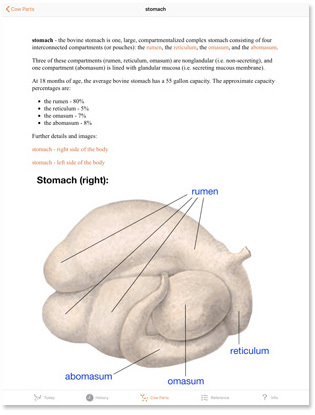 Need to know those bovine body parts because you’re an agricultural student? Then this is the app for you! *terms - words or phrases used to describe something. 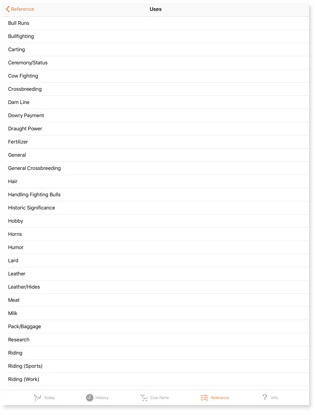 The Favorites section lets you keep a list of your favorite breeds. You can add and delete cows any time you see fit. No matter where you are in the app, you can tap the ‘+ ’button in the upper right corner of your screen to add a cow to your Favorites list. 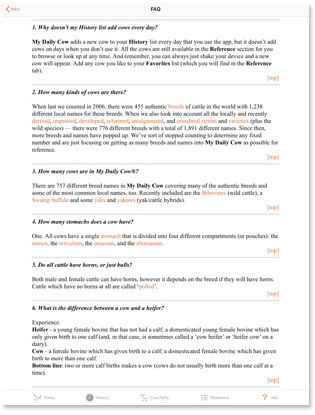 Need basic information for using the My Daily Cow® App? Our Help section is simple and easy to understand. Need to ask a question? Want to give some feedback and tell us what you think? Have you found some incorrect information or think something needs to be included? Please send us an email. My Daily Cow® will respond as promptly as possible. My Daily Cow® respects your Privacy. As we said before, this app does NOT stay connected to the internet. It is not looking for any WiFi or constantly refreshing itself in any way. And we keep no stats. WHEN OPENING, ALWAYS . . .
• Reset All Tabs will make the app default to opening on the first page of each tab each time you open the app. You can moo when you’re in line at the grocery store and want to make everyone smile. Your Daily Cow Sound can Play every time the app opens — or Only For A New Cow — or not at all. Your choice. Bigger, Please does just that – it makes the text bigger for easier reading when desired. Thank you for reading this. We hope you purchase the My Daily Cow® App and also explore this Kranky Kids website for even more cow related info and pictures (look at The Cow Wall).